1.2.4 英語放送スクリプト編: 新潟 E129系・ワンマン列車 - dutcheez’s Fun with English! This is a Shin-etsu line train bound for にいがた. This train is staffed with only one driver. For safety’s sake, please do not speak to the driver while the train is moving. The next station is the Niitsu Terminal. Please change here for the Shin-etsu Line for ひがしさんじょう and ながおか, the Uetsu Line, and the Ban-etsu West Line. Please make sure you have all your personal belongings when leaving the train. Thank you for traveling with us, and we look forward to serving you again. Only the door next to the driver will open. This is a Yahiko line train bound for にいがた. Please push the button by the door to get on and off the train. When you use the close button, please be careful of other passengers. Passengers in wheelchairs: please use the front car. 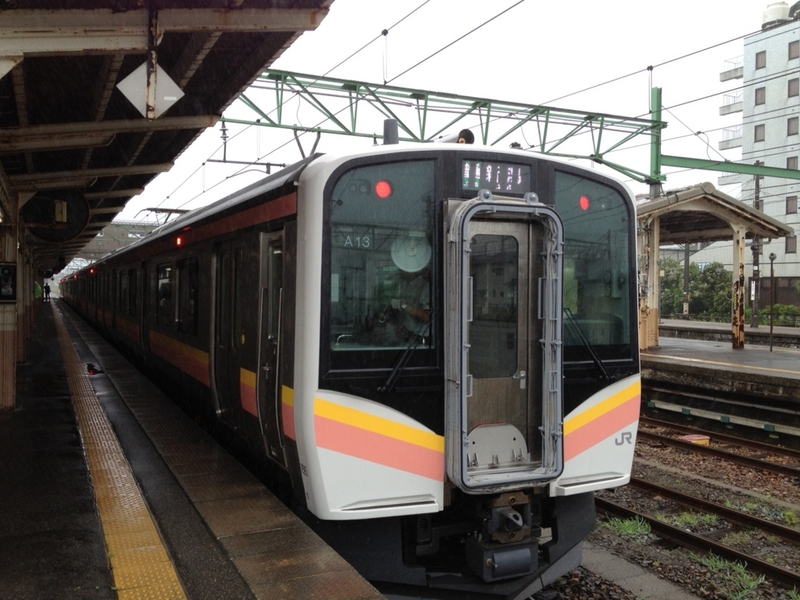 ★This train is staffed with only one driver. This train is staffed with only one crew. This train is operated without a conductor. ★Passengers in wheelchairs: please use the front car.